The Marauder is our hand-wired tribute to the one of the most sought after amps in history, the 1957 "5E81" Dual Tube Rectifier Tweed Twin, with an added twist - a built-in attenuator. 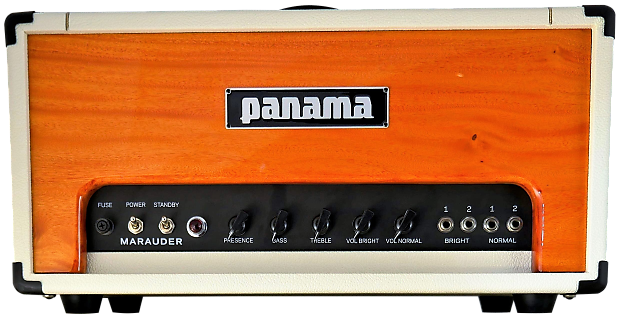 The low powered 5E8A circuit produces 40W of tweedy glory and is enclosed in our gorgeous cabinet with a Palo Mora tropical hardwood top-panel. The Marauder resonates with a warm, woody tone. The Marauder's attenuator allows you to experience the sophisticated breakup of the original at volumes that won't blow out your eardrums. From its harmonically rich clean tones, to its fat tweedy distortion, the Marauder delivers. Powered by 6L6 output tubes The Marauder uses the rarely seen '50s dual rectifier arrangement with (2) 5U4 rectifier tubes. The pre-amp uses (4) high-gain 12AX7 tubes, (3) of which may be substituted with 12AY7s for the original '50s low-gain sound. The control panel has Normal and Bright volumes, (4) Inputs (2 Normal, 2 Bright), Treble, Bass, and Presence knobs with the attenuator.